BlytheLife.com » Blythe Photo Challenge Winner Interview with Jennifer Abe! Jennifer’s photo of Pudding that won the 9th Blythe Photo Challenge! What can you tell us about yourself and how you got into the Blythe hobby? Hi Michelle! I’m Jennifer Abe (pronounced “ah-bay”). I currently live in San Francisco, CA with my fantastic, supportive husband, Peter and our two cats, who are like our children. I’m in my 40’s, but I still feel like a kid at times. Maybe all the toys and dolls I have will keep me young forever! I work for Wells Fargo Bank’s Internet Services Group in the Online Sales and Marketing department here in San Francisco. My job has a nice combination of business and technical aspects, but I like to have hobbies and creative outlets outside of work. Photography has always been a hobby, ever since high school, but I never felt like I found the right subject matter for me personally until I discovered Blythe in February of 2009, almost two years ago. I found a photo of a Rosie Red on Flickr and I was captivated and just needed to find out more about this doll. I never had a Blythe doll in the 70’s, but I sort of remember her, so maybe the image sparked a memory from my childhood. Who knows? At that point, I knew I wanted a doll of my own to photograph! Photographing dolls has really opened a new world for me, with lots to learn and wonderful people to share this experience with. How do you go about planning your photos and setting up the scenes? Sometimes I plan a scene and other times I just grab some photos and they unfold once I have a doll and camera in hand. A lot of my photos are taken off of the little deck off our kitchen, which is at the second story level because we live on a hill. If I have time in the morning or after work and the light is nice, I run outside with a doll in one hand and camera in the other and shoot some portraits. We recently had some grass put in our little yard so I’m hoping to add some variety to my outdoor shots this year and do a little gardening while I’m at it. Most of the scenes I set up indoors are done with artificial light since it is dark by the time I get home from work. One of my favorite places to shoot is actually on the island in our kitchen. It has a wooden top and the overhead light is not too bad. With a wide aperture, I can blur the background. It’s not perfect, but some of my favorite scenes (“I made yours with extra fluff” and “Help me Obi-Wan Kenobi”) were shot there. 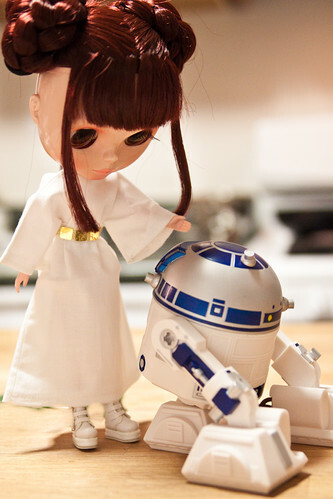 The “Help me Obi-Wan Kenobi” photo with my UT dressed as Princess Leia is the one photo I’ve spent the most time planning – first I got the costume, then I broke down and bought the vinyl R2-D2 I had been eyeing, then I put everything together. Since it’s in my kitchen, it’s not perfect, but I’d like to spend more time planning scenes like that. For the other favorite (“I made yours with extra fluff”), I had the little espresso machine ornament and some Re-ment, but everything just came together spontaneously. I remember not even wanting to take a photo that night, but I was in the “doll every day” group at the time so I had to do something. It’s surprising how once you get started, as long as you are having some fun, it works out and changes your mood. Juniper kept falling over, but my husband (he was holding a light for me) and I were laughing and I ended up in a much better state of mind that evening! Oooh, this is a tough one. 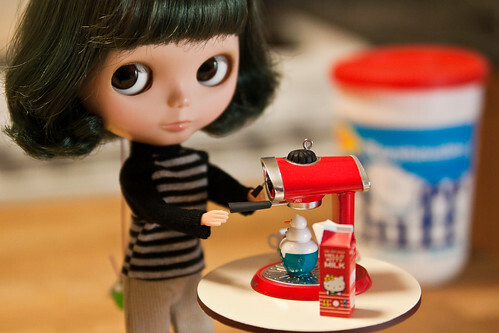 I find Blythe herself inspiring – her face, her big eyes, her quirky expression. I think the photos I’ve had the most fun with have something about “me” in them – Star Wars fan, marshmallow fluff, coffee, working on a laptop, taking photos. There are some amazing photographers on Flickr that inspire me too – anything from scenes that include Re-ment/miniatures, to beautiful nature shots, to crazy funny photos or photo stories that literally make me laugh out loud. I find that it all inspires me to do better with my photos! What kind of challenges have you come across when taking photos of your dolls? My two biggest challenges are light and time. Light because I’m not at home a lot during the daytime and we get a fair amount of fog where we live, so outdoors can often be uninspiring. I mentioned shooting in my kitchen after dark, but this year I’d like to create a better setup for artificial lighting – either with lights or flash. Time is a challenge because I work full time outside of the home and when I’m shooting, editing and posting photos during the week I often end up staying up way too late! I have taken dolls into work with me to photograph during the day, but my challenge there is that unless I want to take another shot of her on my desk, I need to get over the challenge of being shy about taking her out in public! I did take Pudding, my Rosie Red, to the parade after the Giants won the World Series and it was fun! A few people even asked about her and asked to take photos of her. I noticed that you have a fair amount of Blythes, how do you choose which ones ends up being in a photo? Let’s see, what makes me pick one doll over another? Sometimes I’ll get a new dress or outfit that is perfect for one particular doll or something I picked specifically for her, so she ends up being photographed. When I set up scenes with Re-ment/miniatures, it’s usually a doll on a Licca or Pure Neemo body since they are more poseable and it’s easier to make them look like they are doing something. I probably choose dolls with matte faces more often than shiny because they are easier to photograph, and I also find dolls that are boggled and gaze corrected tend to have a look that I have more fun photographing. Sometimes I just look at the shelf and one just pops out at me and inspires me to photograph her – she might be stock, she might be customized – I often don’t know who it’s going to be until she tells me it’s her turn. You may have noticed that my Rosie Red, Pudding, has more photographs on Flickr than any other doll in my collection. She’s the one I bring with me most and the one I have the most fun photographing right now. I think there is something about her that really pops out in the photos I take – something real and magical. She’s also my husband’s favorite of all the dolls in my collection so I’ll often come home to find her posed and doing something, which makes her even more real to me. He actually set up and took all of the photos of Pudding putting lights on the little dolly Christmas tree while I was in the other room! How was your first experience of taking a Blythe out in public for taking photos? Thanks so much for doing this interview with me! What kind of tips or advice do you have for someone who takes photos of their Blythes? Thank YOU for interviewing me Michelle! It’s really an honor and I’m so flattered to be included on your wonderful blog! As for tips, one thing I often suggest is that you turn off your on camera flash if possible because it can be very harsh. Try to use natural light or lights from the sides. Try getting down to dolly level to take your photos or bring her up to your level on a counter or table. If you are out in public, a wide angle with Blythe in the foreground and buildings, etc. in the background will make her look more lifelike, just make sure you focus on her. If you want your background to be more soft and blurry, use a wider (smaller number) aperture if you can and use a your lens zoomed in instead of wide. Some point and shoot cameras will let you get super close in macro mode at the widest angle and this can make for some fun and quirky photos. Experiment with your photo processing software. If you don’t have software, Picnik is a great option – it’s free, fun, easy to use and the premium version is very inexpensive when compared to other programs. If you are interested in learning more about photography and exposure, I always recommend Bryan Peterson’s “Understanding Exposure”. And don’t worry if you don’t have a digital SLR with a bunch of lenses – remember that the best camera you have is the one with you! If you have an iPhone or other smart phone, there are a lot of fun photo apps to experiment with that will give your photos some interesting looks and they also make it easy to upload photos to Flickr and other sites. Finally, my number one tip for someone who takes photos of their Blythes is to have fun! Set up photos that make you smile or giggle. 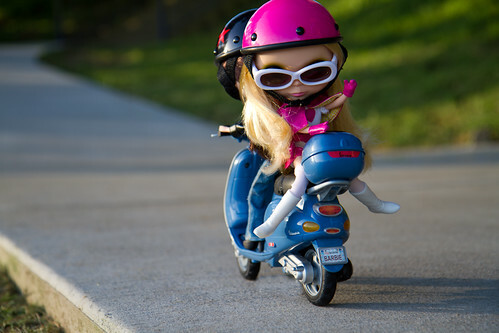 Don’t be afraid to take Blythe out in public or on trips, she’ll help make your journey an adventure! If you’re interested in seeing more of Jennifer’s photography, you can check out her Flickr photostream. 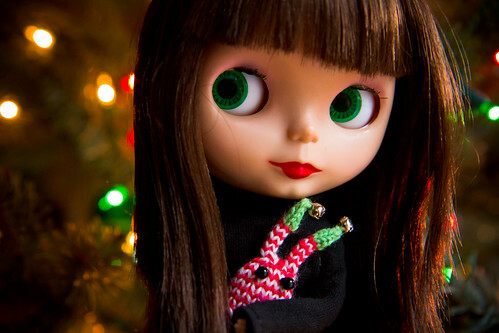 And be sure to check out this month’s Blythe Photo Challenge (both on Flickr and on their blog)! I love the interview!! Thank you both to Jennifer and to Michelle for being a part of the Blythe Photo Challenge!